An early and well-preserved example of a small free-standing Norman tower keep, surviving almost to its original height. It was probably built c. 1080 by Gundulf, Bishop of Rochester, and takes its name from a chapel of St Leonard which once stood nearby. Mr. Clark states that St. Leonard’s Tower is interesting as being one of the first Norman keeps and earliest military buildings since Roman times constructed in England. It is all that remains of the castle built here by Gundulph, Bishop of Rochester, the architect of the White Tower of London, who also founded near-by the religious house of nuns, of which there are still considerable remains, and the church of West, or Town, Malling. The tower stands a quarter of a mile S.W. of the parish church, upon a ledge of sandstone rock, on the E. side of a short valley, which formed its defence on the W., together with a small stream that falls into the Medway, coming from the hamlet of St. Leonards. Gundulph’s Tower is a rectangular building, about 32 feet square at the base, and 60 feet high. In Philipott’s “Villare Cantianum” a drawing is given of it, showing the light and slightly projecting pilasters at the corners, with a single pilaster in the centre of two of the faces ; the summit where the parapet should be is much ruined ; four and five narrow circular-headed lights, or rather loops, appear on the lower storey, and larger ones, of the same character, upon the upper stage, two on each opposite face. On the S. face is a plain, round-headed doorway, now walled up, to feet above the ground, which must have been reached by an outer staircase, and in the N.E. angle is a spiral staircase from ground to roof. There are no fireplaces or mural galleries, and the floors, as is so usual in Norman keeps, were of timber. The masonry is of rough, uncoursed rubble, and from the S.E. corner below the tower is seen a fragment of the curtain wall, 25 feet high, but nothing can be known as to the rest of the castle buildings, which probably extended eastwards on the level ground. 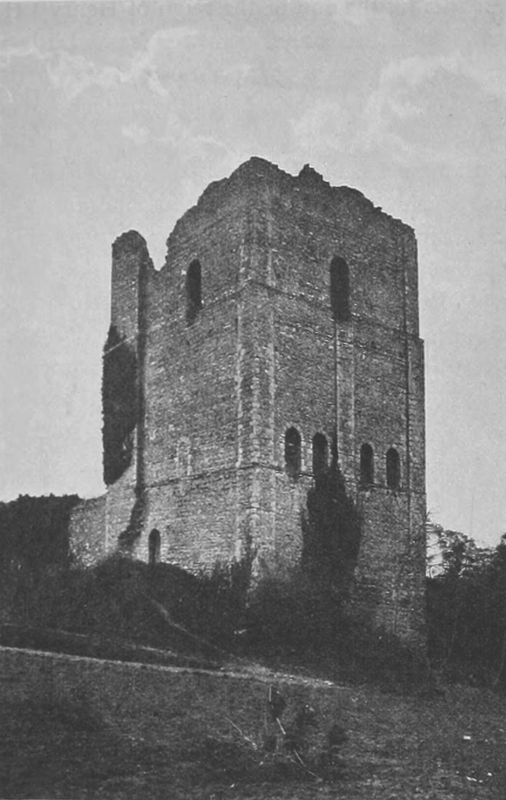 The tower at Malling was examined in 1840, Parker says, by a party of French antiquaries, and was acknowledged by them to be of earlier date than anything of the kind existing in Normandy.